4/1/15 - 5/1/15 ~ . Its our responsibility to update the every happenings to you i.e. our member. YOUR INTEREST IS OUR MEMBERSHIP. Book Lets contains and covers all updates of ASWA in 2014-2015. Bread packets & Fruits Distribution on 20th April(Monday), in Ayurvedic Hospital at Erragadda, Opp ESI, HYD. 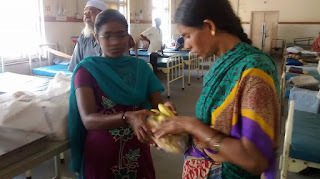 We have successfully completed bread and Fruits distribution at Dr.BRKR govt Ayurvedic Hospital,erragadda on 20th April. We have distributed 66 bread packets and 150 bananas to the inpatients at the hospital under ANNAM PARABRAHMAM Project. Please Join us on every month 2nd Tuesday morning 8:30 to 9:30 and to support us and see the happiness in the beneficiaries. You can support either regularly or on your special days. On this Monday (20th-April) morning at 8.30 A.M to 9.30 A.M, we are going to distribute Bread packets and Fruits to the inpatients of Dr. BRKR Govt Ayurvedi Hospital, Erragadda, opp E.S.I hospital. 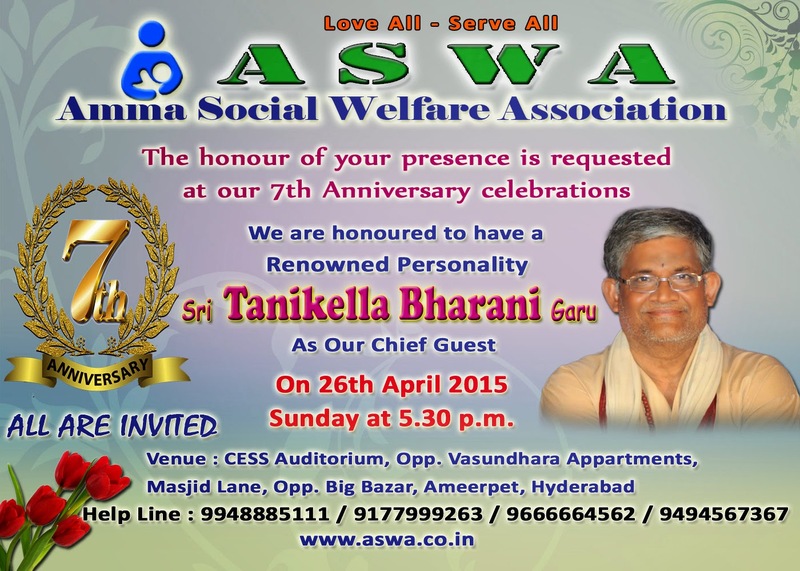 Note : ASWA is going to celebrate it's 7th Anniversary on this 26th april. So,pls be part of this event. I am on cloud nine as AMMA Social Welfare Association (AMMA-ASWA) is going to celebrate its 7th Anniversary and stepping into 8th Year. 7 years of hard work and dedicated efforts of many people constructed ASWA a genuine and organized NGO. The journey is truly amazing and the growth is unexpected. All the things are happening only because our acts are selfless added by you and your consistent support. When I turn back and recollect those memories, its been a dream comes true. A group of 13+ people support to my initial thought of celebrating New Year in an Orphanage home on 1st Jan, 2008 inspired all of us and initiated a thought of continuing these acts regularly. Then Bhadra, Srikanth and Myself started to visit the Orphan Homes regularly, with the concept of spending 1 Hour Per Month. 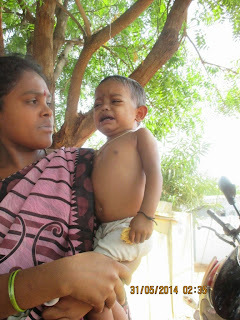 On 27th April, 2008 when we were returning from Bhadhrachalam from a colleague marriage, we received a call from orphan home which we visited requesting funds for little child Appendicitis operation. That is where our concept of saving 100/- Per Month started. 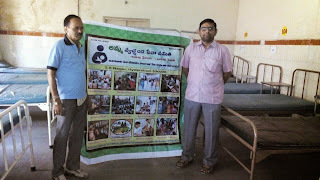 Our activities reached as many people when UMA SANKAR designed a wonderful Website/blog for us. There onward no stoppage for our activities with the Initiation dedicated volunteers, coordinators, Board members, Advisory body and Donors and all related parties. All these added up as fuel to my burning thought of helping others and thus it becomes my life ambition and also trying to inculcate as life style. Latter added by efforts of Adi Lakshmi (My Mother), Srivalli, Prabha, Haritha, Sireesha, Viraja, Sai Sireesha, Mallika, Srinivasa Kumar, Adithya, Surendra, Sarath Chandra, Ch. Pavan Kumar, Vijaya Narasima Reddy, Kilaru Srinivas, Janardhan, Divya, Madhavi, Ranganadh, Girija, Satyanarayana.M, Raghavendra, Durga Prasad, Manoj Kumar, BNJ Pavan Kumar, Suresh Singh, Naresh Kumar, Sreenivasa Prasad singh, Suman, Naga babu, Sai Kumar, Tejo Latha, Naidu, Madhuri, Prasanna,Thanda Prasad, Naveen Kumar(ATP), Basha (ATP), Fakruddin(ATP), Bhargavi (VJA), Vani (VJA), Venkatesh (KDP), Vikram, Dhanesh, Naga Raju, Bikshapathi, Kishore Kumar, Srinath, Mohan Vajjha, Mohan Nag Kumar, Prathap, Sriram Rahi, Anil, Teena, Sujitha, Vaheeda, Soujanya,Lakshmi garu, added 2014-2015 by Sankar Rao garu, Revathi, Sunitha, Mallika, samyuktha, Vinay, Padmini, Shobhana, Masthan, Akash, Rameswar, Nandini, Saranya, K. Sirisha, Chakravarthy, Jayanthi spend their time regularly to help the society and also make ASWA a genuine and organized NGO. Our efforts are well guided by our Advisory Team Sri. Tyagarajan, Sundar, Prasanti & BOSF, K.Prabhakar, Jawarharlal Nehru, Dr. Hemanth and Kali Kiran along with kind financial support of many donors in which few are very regular and assuring us in budgeting next year plans. There is no end to this list, as people who are reason for this organizations initiation, growth and goodwill is huge. My kudos to every one for their continuous support. I am expecting same support from you and also from new members who are interested to serve the society. There is no stoppage to share my experiences once I get into it. And its not possible to pen down all my feelings in this small mail. So I request all of you to turn up to share our happiness and bless us towards more noble deeds. Sri Thanikella Bharani garu also agreed to join us and motivate us with their great words. Our advisory team is always with us on this happy occasion. We always assure you that ASWA provides best services to the society and you always become a proud member of ASWA. 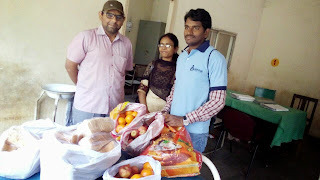 On 19th feb, 2015 we successfully completed Bread Packet and Fruits distribution at Govt Ayurvedic Hospital , at Yerragadda, near ESI hospital, Hyderabad. 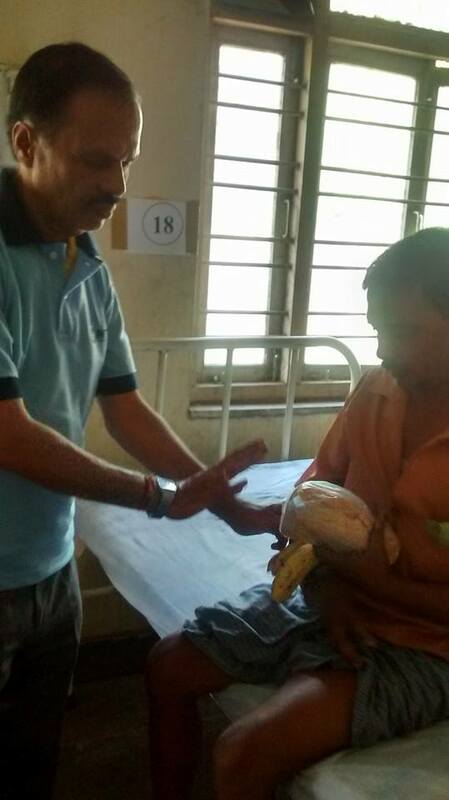 We distributed 50 Milk bread packets and 2 oranges for each patient. Patients felt very happy for our support. This FOOD DISTRIBUTION IS SPONSORED BY SRIKANTH GARU in memory of his grand father LATE Vavilala Subrahmanya Sastry Gaaru. You too can participate in this program by sponsoring fully/partially either Regularly/occasionally. We will start from S.R Nagar at 7:00a.m to Hospital with Bread packets. Interested volunteers can join from here also, Otherwise you can come directly to Hospital . Time : 7.00 am to 9.00 am. I really appreciate efforts of Naveen, Sarath & Srinivas in this regard. This is referred by fakruddin sir(Anantapuramu) Volunteer .Her father(Lokesh) is working as Auto driver by taking Auto on rent base per day Rs 250/-Her is mother is House wife. They have two daughters Elder daughter have 5 years studying 1st class and younger daughter is 2 years i,e Maha Lakshmi. By born the baby have the problem.Heart is on right side and three walls are closed.The baby suffering from Regularly fever,cough&cold and becoming very week . 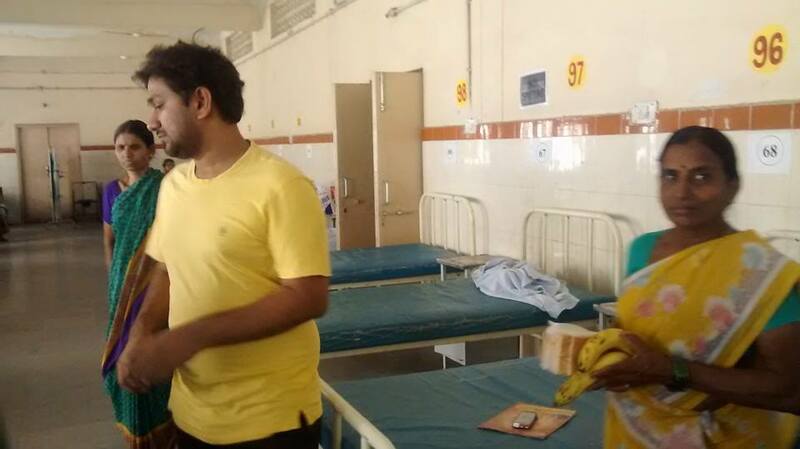 Initially they went to Narayana Hrudalaya Hospital,Bangalore for checkup. they said that they require surgery after two years. Mean while they have to used medicines. 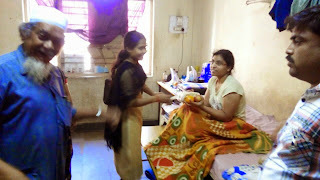 After completing two years they went to Narayana Hrudalaya Hospital,Bangalore. The doctors said required 6 surgery's for each surgery it cost around 4 Lakhs.As they are not able pay that much of amount for surgery.Even though not able to pay amount for tests also. So they contacted us with reference of Fakruddin sir . So our Anantapuramu Volunteer Naveen verified and found it is genuine so that our board members are approved to help them. 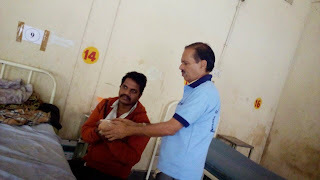 Later on we referred Care Hospital and they said to take Angiogram test to know the status of baby .So we paid amount of Rs. 10,000 for Angiogram test . Doctor's said that baby needs heart surgery .So they doctors discussed and inform to parents after discussing with doctors about surgery date. Our volunteer Sarath Chandra really work hard for helping them .At that time all our volunteers busy with their schedules and no one available to 8 take care of them.So Sarath chandra will taken responsibility for guiding them even he is in night shift. No words to appreciate for sarath chandra efforts. Really they showed very patience and helped them. 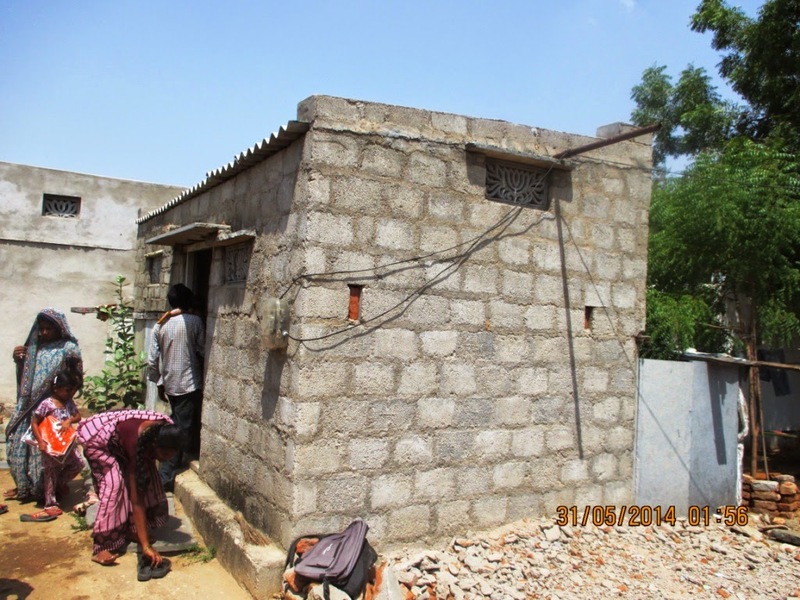 Sarath Chandra,Haritha and Naveen involved in this help request.